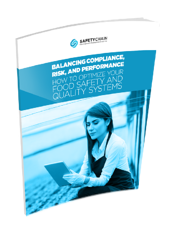 In this exclusive ebrief, learn how leading companies are employing simple yet effective strategies to optimize food safety and quality management (FSQM) systems for improved operational performance. This quick read will give you insights on how to move beyond basic compliance to actually improve operations and proactively mitigate risks for optimized performance. From reduced waste to increased productivity, get insights on the ways companies like yours can benefit from optimization.